I have been using Roland guitar synths since 1994, starting with the now legendary GR-1 and working my way through to the most recent GR-33 version. Being a tech fanatic, it is no surprise that every time Roland releases a new shiny box, my pulse races and the hairs on the back of my neck stand up. When the announcement of the new GR-55 guitar synthesiser was made at the 2011 Winter NAMM, the news was equally, if not more, exciting. This time around Roland was marketing the GR-55 as a kit-killer, a one box solution that would do away with the GR-33, the VG-99 guitar modeller and any other stomp boxes you might employ. The promotional videos near enough spelt this out in huge flaming letters four hundred feet high. So, the GR-55 had a lot of hype to live up to but this didn’t stop me pre-ordering my unit. I’ve had my GR-55 for a couple of weeks now and I thought it was time I posted some thoughts on it. First off, I must commend Roland for returning to a metal chassis when building their effects units. The VG-8 and VG-88 both sported metal cases and looked like Stealth bombers and this gave the units a sturdiness that was comforting. Other units such as the GR-33 or the VG-99 have relied on lighter, less solid plastic constructions, so it was nice to see that the big blue GR-55 was rock solid. It instantly makes you think you’ve bought a quality piece of kit. The buttons are solid, the footpedal exudes quality and there’s a nice big rotational control knob flanked by press buttons to act as your main navigational tool. The display is lovely and large and is a refreshing change to other guitar synths I’ve had which often have relied on double line LCD displays which tire your eyes really quickly. The GR-55’s display takes a page from the VG-99 and writes its messages to you in large friendly letters. The editing and patch access takes getting used, relying on lots of flicking through the “Page” buttons to access features and it can be a bit overwhelming remember where patch functions are. But I am sure with some more practice this will come second nature to me. But what about the tracking? Yes, the most important quality of a guitar synth is how well it tracks on your guitar and I can say, hand on heart, that the GR-55 is the best guitar synth for tracking I’ve ever owned. With minimum setup, even my nylon string Godin Multiac ACS was triggering sounds very accurately. The sounds themselves are very high quality and in my opinion, superior to the GR-33 and hark back to the top end synth sounds of the GR-1. Of course, some of the patches are near useless and will need tweaking, but I was very impressed with the pianos and the wind instruments. The flute patch itself is very expressive and sounds utterly convincing. The unit also features a USB stick reader so it can be used to playback WAV files – making ideal for solo performers to pack backing tracks with them – and there’s a 20-second looper on board too. The looper itself is good fun allowing you to capture ideas and to overdub on the top of the original loop ad infinitum, but compared to one of the RC units put out by Boss (Roland’s dedicated guitar business) it feels quite limited. However, it is an extra value feature you get with the unit and should be considered in those terms. Connectivity involves a USB connection to a computer allowing you to backup any patches, but I don’t think that there’s a dedicated patch editor for the GR-55 yet. This would be a great tool to have, especially if you have trouble editing on the GR-55 unit itself. 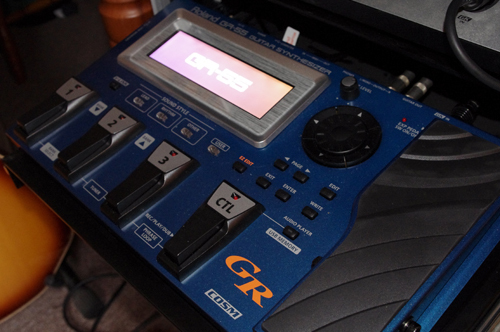 But the big question thrown up by the GR-55, or more specifically by Roland’s original promotional material, is whether you can throw away all your other effects units if you buy a GR-55? Well, you can certainly sell your GR-33 on eBay because this is the superior item on every level. But if you use a VG-99 for recording, then you might want to consider holding on to it because some of the COSM guitar modelling sounds OK, but nowhere near as rounded as the VG-99. Of course, hearing is subjective and you might think them acceptable. I can see the GR-55 being used by gigging players to replace racks of equipment as I think the pedal would be great in a live situation. Overall, the GR-55 is a jump forward in the technology and a welcome addition to my sonic armoury. If you are considering purchasing one of these units then you I believe you won’t be disappointed. If you are looking for a cheaper option or your first foray into guitar synths, then check out eBay for all those GR-33s and GR-20s that are being offloaded by new GR-55 owners! And here are three videos I’ve made to demonstrate the GR-55. I used my Godin Multiac ACS nylon string guitar to show how well the GR-55 tracks.